Hello there. In a fit of late-night brain-freeze I’m vignetting this, barely editing, and going to bed. Better buckle up. 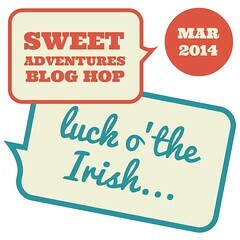 I’m hosting Sweet Adventures Blog Hop this month and with the hop starting on 17 March I simply had to make the theme St. Paddy’s Day related. However, other than the festive green colour of this pie, any relation to the holiday, country of origin, or leprechauns at the end of rainbows are tenuous at best (and quite possibly non-existent). But hey, at least it’s green and I did offer that up as a perfectly acceptable interpretation of the Luck o’the Irish theme. I’ve been wanting to make this pie for years — ever since that Vegan Chocolate Ice Cream changed forever how I looked at dessert and avocados. But for a pie like this I needed a reason, an excuse if you will, although I shouldn’t as it is so ridiculously easy and healthy. 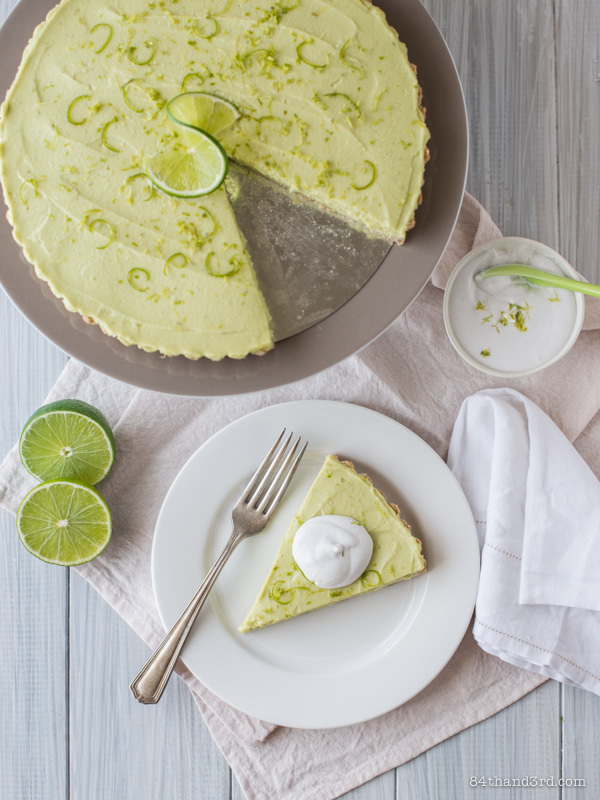 A requirement of a dessert with a green theme was a perfect excuse, and once decided no number of authentic Irish recipes or rainbows or shamrocks could change my mind. 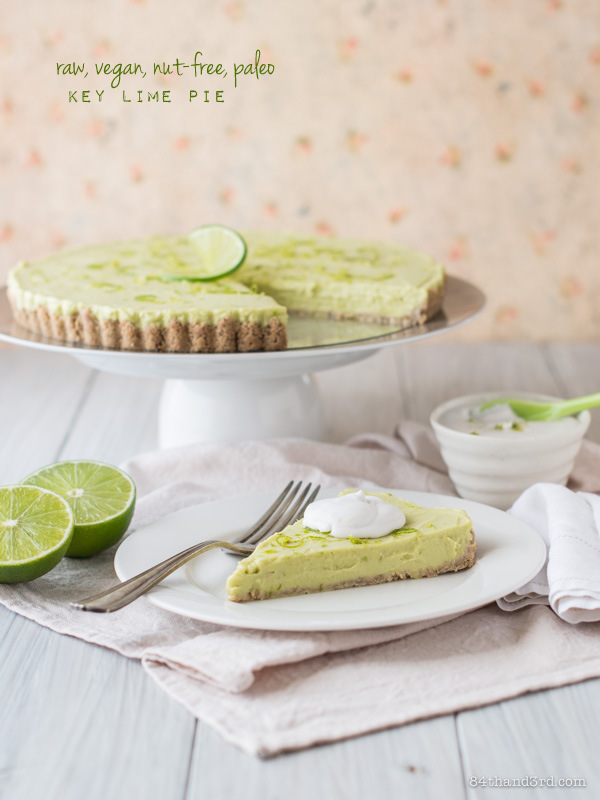 As for the ingredients I could have just started with my Vegan Cheesecake Recipe and modified it, or used those Lemon Custard Bars and done the same — but where’s the fun in that? So my first goal for this pie was to not use nuts or cauliflower. I knew that if all my intentions turned into a green-ooze I could always just blend it with cashews and the day would be saved, but I hoped it wouldn’t come to that. And as (Irish, not that I’m any more than 1/100th Irish) luck would have it, it didn’t. We bought a new bed the other day. Our current one, while not in bad shape, is about 20 years old and we’d been saying for ages it was time for a change. We decided the old one could serve quite well as a guest bed, but in preparation we had to clean out the second bedroom to make space. Cleaning out that room is an enormous undertaking but it gave me an excuse to reorganise some of the boxes that came back from NY with us (oh 5 and a bit years ago, ahem). One such box was a collection of things from my primary school days and sitting in the middle of the hallway condensing things down I opened a thin, wide-ruled, notebook — circa second grade or so — to see what it contained. The very first page I turned to was a short narrative about making cranberry sauce — can somebody tell me why it took me over 30 years to finally figure out I should be working with food? Anyway. The subject matter was certainly cause for pause but what I found even more amusing was the teacher’s comments, “you need to use sentences”, written in red pen next to markups indicating insertion of periods at the end of one thought and capitalisation at the start of the next. I’m better than I used to be (as that half page about cranberry sauce was written in its entirety with a few commas and only a single full-stop at the end) but I do still love a long sentence. Also, I still love cranberry sauce made with fresh cranberries and oranges fed through an ancient meat-grinder, but that’s another recipe for another day. 12 years ago this very day my traveling partner in crime and I — along with her boyfriend and two of my roommates from Colorado who happened to be visiting us in Sydney, plus a few people who we went to university with and randomly bumped into halfway around the world years later — headed out for a Sunday afternoon of debaucherous St Patrick’s Day festivities in The Rocks. And with that (whatever that was) I give you pie and wish you the very best of luck in discovering your pot of gold at the end of the rainbow. I knew this pie would be good but I had no idea how good until I tasted the filling and it stopped me in my tracks, seriously. 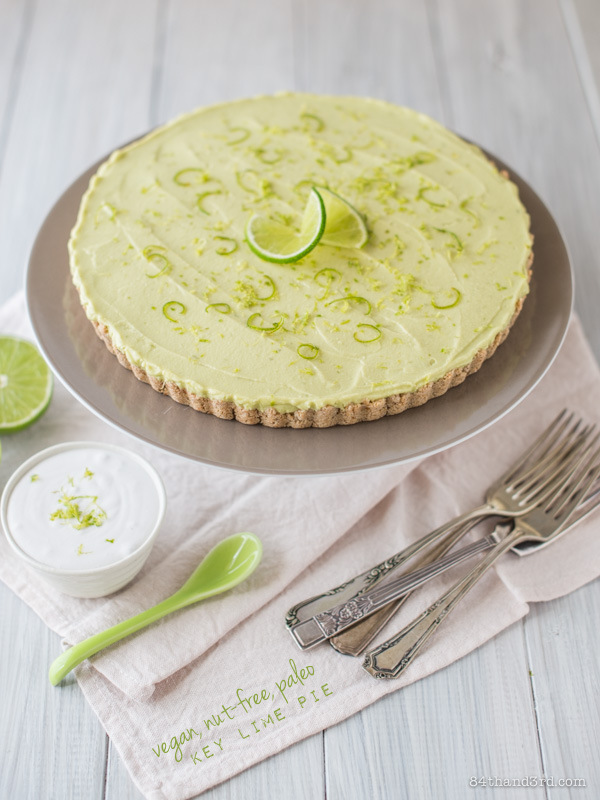 It is the most perfectly creamy lime custard I’ve ever had. The recipe is a bit tart, because that’s how I like my citrus, but feel free to add more sweetener to taste if you wish. Prepare crust in an 8 or 9 inch tart tin, if baked allow to cool completely. Blend avocado with lime juice and zest until very smooth. Blend in coconut cream and syrup. Blend in coconut oil. Mixture should be thick, and will further firm-up on refrigeration, but if you want it even thicker blend in coconut flour. Pour into prepared crust and refrigerate at least four hours or overnight. Serve with whipped coconut cream if you wish. Crust: I used my new Vanilla Amaranth Crumb Crust (gluten-free and vegan) but you could also use a Raw Macadamia & Salted Caramel crust or a Gluten Free Spiced Quinoa crust or pretty much anything else you fancy. 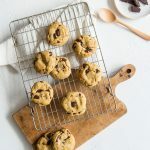 Coconut Flour: coconut flour, unlike wheat flour, doesn’t need to be cooked (it is just coconut flesh, from which coconut milk has been made, which is then dried and ground) so you can add it to raw desserts without issue. The March Luck o’the Irish themed hop is open for linkup until 11:59 pm, Friday 21 March [AEST Sydney time]. Add a link to this post somewhere in your post – You won’t be able to link up in the hop without a ‘backlink’ to this hostess post included in your post. Click here for the Thumbnail List code – Copy the code and add it to the bottom of your post in HTML view. Click here to Enter the Hop – Make sure to do this step so you appear in the list too! Add the link to your SABH post (NOT your homepage). Your entry will be submitted when you click ‘crop’ on your photo. If you have a question or aren’t sure of something don’t hesitate to ask. For more information detailed instructions can be found here. 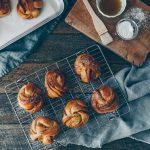 Remember, SABH is open to all food bloggers but only new posts published after the hop goes live can be linked up. Sweet Adventures Blog Hop is brought to you by 84th & 3rd and monthly Guest Hostesses. 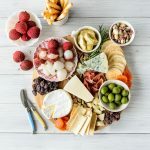 Follow on Twitter: @SweetAdvBlogHop and Facebook: /SweetAdventuresBlogHop for new hop announcements and general deliciousness. Thanks for joining SABH! G’day! Your pie looks terrific JJ, true! Wish I could come through the screen and try a slice or two! Well the luck of the Irish certainly worked for you! Love the pie and all your creations. Looks gorgeous JJ! i love this version as i was just looking for a suitable recipe for a collegue who is gluten intolerant and allergic to nuts! Stunning! What glorious sounding recipe. I am going to give this a try on the weekend. 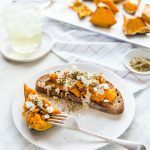 I really love that this recipe is nut free – there are so many nut based cheesecake-type desserts but I have a friend who can’t eat nuts or dairy, which always proves difficult! Plus it looks delicious. 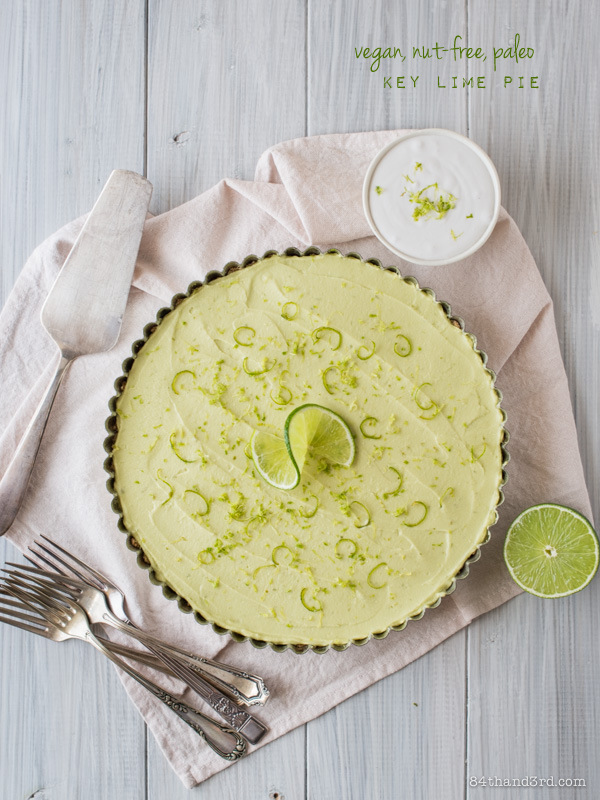 There’s a raw lime pie that I get at the Noosa Farmers market that looks just like this and tastes amazing. Looking forward to making it myself! Love the story of how you met your husband! And this cake sounds incredible. 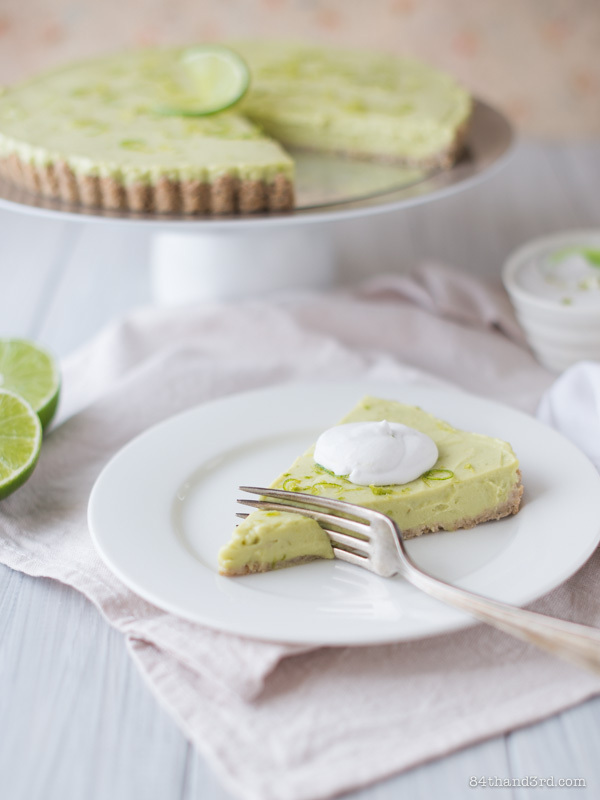 Oh wow, this pie looks SO great and I love that it’s paleo + raw, too. So neat! You should frame that 2nd grade story! How wonderful to be doing something that was obviously part of your DNA! Lime Pie looks great and yummmy!!! Thanks for making me crave. 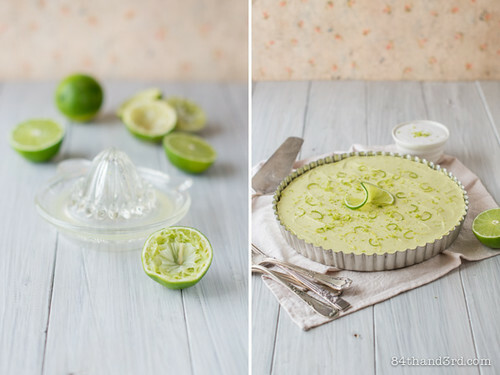 Beautiful pie, I love lime desserts!